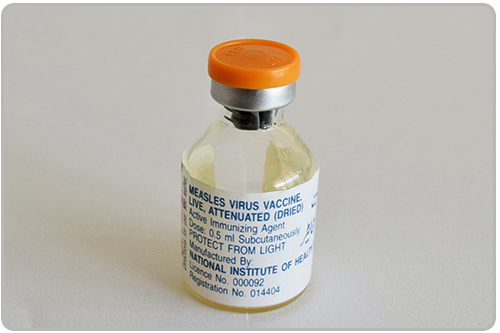 Measles Virus Vaccine, Live, Attenuated (Dried) is prepared in avian leucosis-free chick embryo fibroblast cultures from the connaught strain, a strain of measles virus derived from the same orignal isolate as were other vaccine strains, such as Schwarz. The connaught strain was attenuated by sixty-nine passages in chick embryo fibroblast cultures. The vaccine is freeze-dried in multiple-dose vials. Each dose contains not less than 1000 TCID of measles virus and not more than 10 mcg streptomycin and not more than 0.5 mcg neomycin. The vaccine fulfills the WHO Requirements for Measles Vaccine (Live).